H4 45mm bits with sandblasting and nickel plating finish enhance the anti-rust property. Model :SS-5108. Bits model : Pentalobe: 0.8, 1.2. This 21in1 repair opening tools kit can be used to help you repair your cell phone. 1 21in1 Cell Phone Repair Tools Kit. Specifically designed for opening iPhone 3GS, 4 ,4S ,5 ,5S, but not limited to them. Phone NAND Test Fixture. Soldering station & iron. Screen Repair Kit. Phone Opening Tool. Hand Repair Tools. Phone Repair Cable. Light weight and proper size, convenient to carry. Repair accessories. Quantity: 7pcs. -It includes 2 scrapers, 2 picks, 2 mini screwdrivers and 1 suction cup. -Compatibe with: For iPhone 4/4S/5/5s/6/6Plus, iPod Touch, for Samsung galaxy, for Nokia Lumia. 1 x 7 pcs Tools Kits. 1 x 19 iN 1 Screwdriver Set. Screen Opening Plier Size: 17x8.5cm. 1 X Screen Opening Plier. Baby Supplies. Dual tipped design,various blades for every repair situation. Ergonomic silicone handle,non slip, easy to use and handle. Esdabem Repair Tool Kit for iPhone 7 Complete Premium Opening Pry Tool Kits with Premium Screwdriver Set for Apple 7, iPhone. 1 x stainlesssteel double headed crowbar. 2 x plastic pry tool. Professional iPhone 7/7Plus repair tool kits: to repair your iPhone, Apple iPhone 7, iPhone 7plus, iPhone 6Plus, iPhone 6S /6/5S/5/5C/4S/4/SE, iPod, iTouch. Ergonomic design: more convenient and efficient, easy to use. 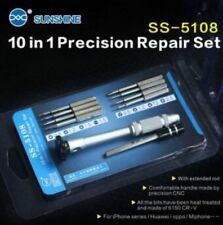 Professional iPhone 7/7Plus repair tool kits: to repair your iPhone, Apple iPhone 7, iPhone 7plus, iPhone 6Plus, iPhone 6S /6/5S/5/5C/4S/4/SE, iPod, iTouch,and more smart phone. Esdabem Repair Tool Kit for iPhone 7 - Complete Premium Opening Pry Kits with Titanium Alloy Screwdriver Set X/8/8 Plus,7plus, 6Plus/6S/6/5S/5/5C/4S/4/SE, iPod, iTouch. Professional iPhone 7/7Plus repair tool kits: to repair your iPhone, Apple iPhone 7, iPhone 7plus, iPhone 6Plus, iPhone 6S /6/5S/5/5C/4S/4/SE, iPod, iTouch,and more smart phone. Esdabem Screwdriver Repair tool kit for iPhone X/8/7/7Plus and more Smart Phone. Esdabem Professional Repair Tool Kits - Repair and LCD Display & Touch Screen. Ergonomic design: more convenient and efficient, easy to use.